Questions about Worldly Gray SW 7043? Please leave a comment below! Crushed Ice is a gorgeous soft blue-gray color, but after looking at Worldly Gray and Crushed Ice together, I had other trim ideas that I felt would coordinate better with Worldly Gray. To still achieve the soft gray-tone trim without too much of the blue, I would suggest trying Incredible White or even Shoji White, which is one shade lighter on the paint chip. Those will also give you more of a contrast. If you are wanting to try even more of a contrast in a different way, try using a darker gray color, like Warm Stone or Griffin. I love this look. Let me know what you end up trying and if you would like further help, please visit my Color Consultation for more information. Thanks so much! I would like to do Worldly Gray as the main color in my house. I have an open floorplan with the Dining room as the only room that could be painted a separate color. All of the complimentary colors you have listed go very blue or green. Do you think Dorian gray or Dovetail would work in the dining room as a compliment? We have white wainscoating on the bottom half of the wall, so it would just be the top half that would be painted. Thanks for your help! Worldly Gray is a great color! And yes, I do think that Dorian Gray or Dovetail can both work in your dining room as a compliment, especially if you are wanting to go more monochromatic. 🙂 I love the way that Dorian Gray and Dovetail pop out and contrast against white trim! Please feel free to reach out for a Color Consultation if you need further help. Thanks so much for reaching out and have a great day! Hi Laura, I plan to paint the main living spaces in Worldly Gray. I would like to do a very dark accent wall above the fireplace to ‘hide’ the television…possibly darker than what is posted here. Any suggestions please? Thank you soooo much Laura! Would you have any recommendations for a blue for the boys’ bedrooms that would work with ‘worldly gray’ in the halls? We have decided on Silver Strand and Sea Salt for the bathrooms. 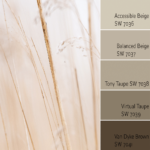 I’m thinking Accessible Beige for the Master Bedroom…maybe Mindful Gray. Thoughts? You are welcome! I would love to help further, but really need to see more of the fixed elements (flooring, etc) and other aesthetics (bedding, artwork, drapery, etc.) 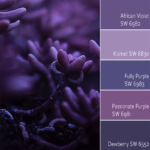 that you have going on before suggesting a color that will work best for you in your spaces. Please feel free to contact me for a Color Consultation so I can give you the best paint colors to tie everything together. Thank you so much! And the vanity is thatch (omega) the counter wil be white. What do you think? Worldly Gray and Agreeable Gray look like they are a bit too gray to go with Capri Classic tile. I would consider an off-white color that has a touch of a warmer greige undertone. I would love to help through a Color Consultation if you are open to it so we can nail down the right color for your space. Thank you for reaching out! Walls are wordly gray in kitchen, what dark gray would work for cabinets? Or light gray? I personally love white cabinets and have a few go-to whites that I use all of the time. I do like the look of darker gray cabinets for lowers or for your island. All white is more classic and timeless, and the dark gray more trendy, but either could work! 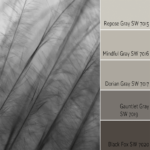 I would love to select the perfect color for you through an Interior Color Consultation! Let me know if you are interested and we can get started. Thanks so much for reaching out, Linda! I look forward to hearing from you soon. When you select a paint color for a kitchen, to what extent do the countertops figure in to your recommendation? We are interested in painting our kitchen Worldly Gray, and our countertops are a Gray and White Caesarstone. The Gray on the countertop is a classic gray (cooler in tone), whereas Worldly Gray leans more to the brown. Is this is issue? Great question! The countertops do play a part in choosing colors. My advice would be to paint a sample board of Worldly Gray and place it next to your countertops to see if the undertones work together. The colors don’t have to match exactly, but they do need to compliment each other. Let me know if I can help further through an Interior Color Consultation. Thanks for reaching out! 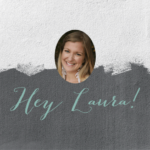 Thanks for your quick reply, Laura! Once we get closer to re-painting the house (once our tenants move out), I’ll be touch about your consulting services! That sounds great! I look forward to hearing from you then. We are painting our kitchen Worldly Gray and painting our cherry cabinets white. What white would you recommended for Worldly Gray walls, dark gray marble countertops, and medium-dark handscraped floors. We are looking at Dover White, Pure White, and Alabaster. Thanks! I love Worldly Gray! Try some samples of each white to see how they look. I tend to lean towards more of true white (like Extra White), especially with your gray countertops. Let me know what you decide! I’m thinking about Worldly Gray for hallways and main living spaces (white doors/trim). Would Sea Salt look okay in the Master with Worldly Gray in the hall? Great paint choices! I do like Worldly Gray with Sea Salt. The gray in the Worldly Gray works well paired next to the blue-green undertones in Sea Salt. Let me know how it turns out or if you need more help through an Interior Color Consultation! I’m thinking of using Marshmallow on the walls in my library. Not much of the walls show because of the bookcases, except one wall that I’d like to do in either Worldly Gray or Agreeable Gray to give a little contrast. Then, I was thinking of using Perfect Griege on the door and closet trim throughout the space. The library is an open concept with a nice size space right next to it that I use as an office. I love Copen Blue for the walls in the office. Do you think these colors will work together? Thanks for reaching out! My suggestion would be to do all of the walls in the same color and then go a few shades darker for the trim and the doors. Something like: Agreeable Gray on all walls in library and Warm Stone for the trim/doors. Copen Blue would be really pretty next to the Agreeable Gray walls in the library! Let me know if I can help further through an Interior Color Consultation. What to paint the fireplace. I want both colors to compliment one another. Thanks for reaching out! I love the look of a white fireplace, especially with a color like Worldly Gray. It may depend on what other elements you have going on in the room. I would love to help you nail down the perfect colors through an Interior Color Consultation if you would like! Room worldly grey. Any idea on what to paint fireplace. I want both colors to compliment one another. I actually really love a painted white fireplace and it would look perfect paired with Worldly Gray! If you want to go darker, try going a few shades darker on the paint swatch than WG. Keep me posted on what you decide! I’m planning on painting my home worldly gray – however in my master bedroom it looks silver! Everywhere else it looks browner/greige. Any suggestions. just change it to another color? I’ve tried collanade, agreeable, amazing, repose and perfect greige and they are all not working for this one bedroom. Thoughts? Thanks for reaching out! Are you wanting your bedroom to have more of a greige feel or are you open to going with a different color all together? It would be nice to do a soft gray-blue for your bedroom if you want to mix it up! If you want to keep it more neutral, try a greige with warmer/brown undertone. 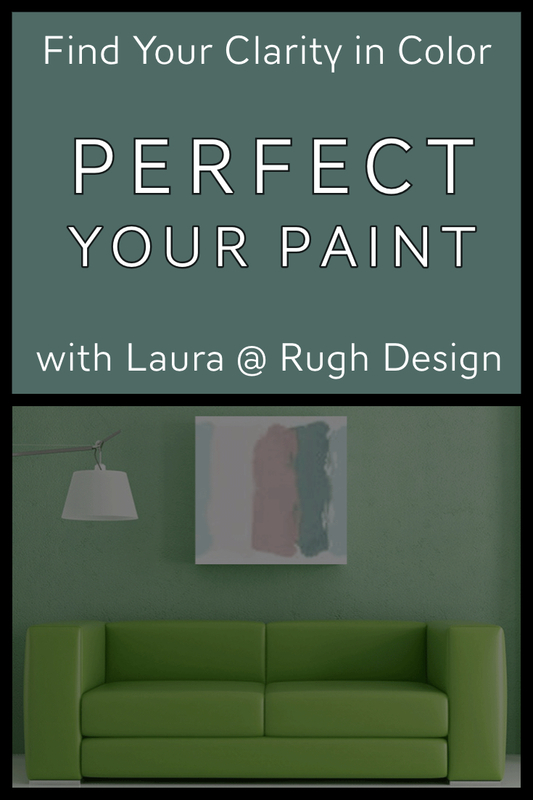 I would love to help you nail down the right color through an Interior Color Consultation if you are interested! We think we have decided on our exterior paint colors. We love urbane bronze for front door and garage. We picked worldly gray for body but now I’m worried about how it would look with our ugly green roof. Unfortunately, that can’t be changed. Trim we were thinking alabaster for some reason shoji looks pinky but may try that one again on a white board so the color doesn’t get influence by our salmon colored house! ??????? ?‍♀️ My question is do you think these colors would work well together with a green roof? Would the green roof make the gray look different and what color would you paint the gutters, soffits alabaster or urbane with a green roof? Hello! We recently purchased a real “fixer upper” and in the process of painting all the old, yucky oak trim Extra White. The realtor had talked them into painting the entire home Worldly Gray (thankful for that as the ENTIRE HOUSE was once BRIGHT neon salmon/peach- yowza!). I recently painted the dining room Dior Gray (Ben Moore) with white wainscoting from the chair rail down and I love it. I don’t know what the SW equivalent to Dior Gray would be but our living room is attached to the dining. I am thinking about painting that room another color vs the Worldly Gray. Any suggestions? I’m painting the entire main floor, all of the floors are natural non stained red oak hardwood, the trim is wood, a century arts and crafts era home. The fire place is chocolate brown brick with a wooden mantle similar in colour, honey to the trim. I’m wanting Worldly gray for every room. But do I paint the trim? My boyfriend suggest a slate black colour and to do the hearth skate as well. I’m scared to paint this trim. I’m an artist and the house is full of paintings, and sculpture by various artists in various styles, although the house is old, all of the fixtures are modern linear and flat black. Typically, I am a “paint all trim white” gal, but when you mentioned that your home is old and has an arts and crafts style, I am feeling like maybe it’s best to keep it. Black or slate black is becoming more and more popular for a trim option, but if you are hesitant, then I would wait on it. I think that it’s best to keep the architectural integrity of the home and let your artwork be the focal point! Hi there! I have a bedroom facing the water with wood paneling. The other 3 walls are drywall. I painted the paneling worldly grey. What would be a complimentary color for other walls? Or should all walls be WG? Which wall should be accented color? Thinking sea salt…. thank you for your time! Thanks, AnaLee! I hope to hear from you soon! Hello! I am remodeling my very tiny bathroom. I am looking at painting the bathroom with worldly gray. I would like to paint the vanity a color on the monochromatic scale. Which color would you suggest? Thank you for reaching out. I would love to help you with bathroom design project! I offer a variety of Color Consultation and eDesign packages for projects such as yours. 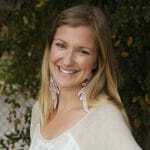 You may see examples of my work on my portfolio page. Thanks, Jen! I hope to hear from you soon! In an open concept where one room is a den, and one is a playroom, could I use the colors Worldly Gray and Mink? Thanks for reaching out! Worldly Gray and Mink do work well together for an open concept. Keep me posted on your design project and let me know if you need further help coordinating everything through an Interior Color Consultation or eDesign! Hello, I am wanting a light blue paint (think haint blue) that coordinates with Worldly Gray. I am painting the interior of my house Worldly Gray. The blue is for the coffered ceiling in my dining room. The dining room trim is white along with white wainscoting. The floors are a medium oak and the furniture is cherry. Love your website. Thanks for your help. I painted my great room worldly gray. I am not fond of bright white so I tried shell white and pearly white for the trim and fireplace. I felt the pearly white was not enough contrast(too gray in color) and the shell white was still too bright white. What trim color would be a good companion to worldly gray if I prefer a softer creamer white to a bright white?